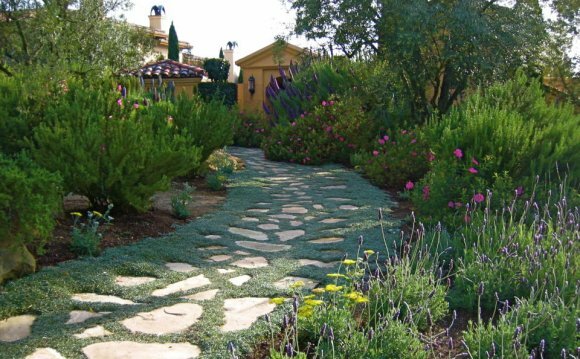 The following are a few basic rules that will help you achieve beautiful landscaping results. Establish the outline of the bed design that you would like for your landscaping. Most people are too conservative when comes to laying out the planting beds. Make the beds plenty large enough. All beds should be at least 4' wide at their narrowest point. Trust me on this, anything smaller is too small, and down the road you are going to wish you did it different. Take into consideration the size of the plants once they mature. Sure you can keep them trimmed, but you can not keep them dwarfed. You've got to give them some room to grow so that your landscape will come together and look nice five years from now. Your landscaping should look better in five years than it does now. The above photo is a simple ranch home. By getting a little extravagant with the bed sizes and extending the beds considerably beyond the ends of the house, this house will take on an entirely different appearance as you will see in the photos below. Proper landscaping can completely transform a home. Raise the beds at least 10" with good rich topsoil. This is the most important step of all, and most people mess it up. Topsoil is expensive, and wheelbarrowing it is hard work. Don't let either of these points enter into your decision of how much topsoil to buy. If you're working on a very tight budget, then spend all your money on topsoil. You can always add more plants, or put in different plants later on, but once you have the landscaping installed you can't go back and add another 6" of soil, at least you can't without doing a lot of hard and unnecessary work. Always ask about unscreened soil. If the dealer has unscreened soil that he is willing to sell you, then he must have good quality soil. Pay attention to how they handle the soil as it goes to the screener. If they have to claw it out of the pile with a backhoe because it is packed so hard that the front-end loader can not penetrate the pile, then you don't want it. Hold the soil in your hand. If it appears to be little round balls and not grainy soil, beware. Often times a clay based topsoil will come out of the screener as small balls of soil. As soon as you put it in your planting beds it will pack down tight again. This type of soil is no good for plants. Plants need to breath. The roots have to be able to get oxygen. You're better off with topsoil that has a lot of small rocks in it, rather then a clay based soil. Look for white roots in the soil. You don't want to buy soil that has roots that are still alive, you'll get all kinds of weird coarse bladed grass and other undesirable weeds throughout your landscaping, that will be very difficult to control. The secret to great landscaping is the plants you select. Plant selection is everything. Once you have the beds laid out, and raised at least 10" with good rich topsoil, design your landscape on paper. You don't have to know exactly what kind of plants you want in your landscape, you just need to know where the very low growing plants are going to be, and how many of them you need. How many medium sized plants do you need, and where are they going to be planted. And how many specimen plants will you need, and how many plants do you need to accent the specimens? Then take your design to different garden centers, find the most knowledgeable person there, and start asking questions. Ask for their recommendations for each plant on the plan, and then ask to see the plant. Take note of the price of each plant, but don't let the price play much of a role in your final selections. Note: To get the best landscaping advice at a garden center, visit during the week early in the morning. This is usually when they are the least busy, and the most knowledgeable person is more likely to be available to help you. The nicest plants in the garden centers are the most expensive. Plants are funny creatures. Sometimes the less expensive plants look much nicer, and are actually bigger, but in the long run the more expensive plant will serve you better. The price of a plant is determined by the amount time it takes to grow it, and the costs incurred in growing it. Thus fast growing plants are cheaper than slow growing plants, but slow growing plants almost always make better plants in the end.